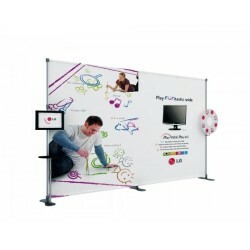 Low cost advertising stand Discover the advertising stand at bargain prices ! 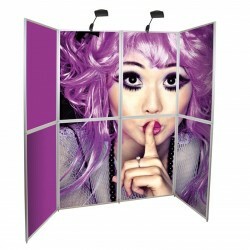 It will allow you to announce when your various events like trade shows at a reasonable price, but to shine. This wall mountable 5min. Carry bag included and included print! Discover this display wall made up of several extrawide kakemonos. These kakemonos form together a display wall light and foldable. It will be complet for people wishing to have an important visual impact, with easy transport and completely personalized structure! Delivered in its bag for a practical transport!Offered printing ! 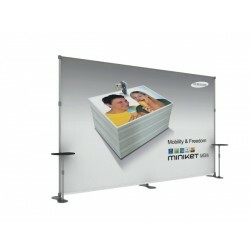 Adjustable and personalized stand One of our best prices when it comes to combine fast installation and visual impact. Adjustable wall, personalized and adjustable in height! Delivered in a bag for convenient transportation! Printing free! Adjustable wall advertising This advertising wall has the advantage of being guided by the size of your stand. 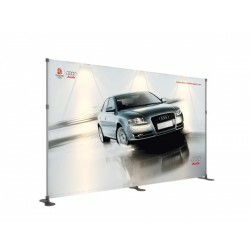 Fully customizable, it will allow your business to have an incredible visual impact on all your shows or exhibition. Delivered in a bag for convenient transportation! Printing free! 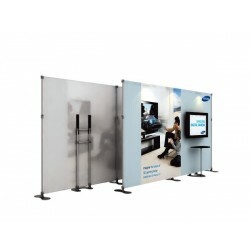 Personalized and flexible stand You go regularly on exhibitions, but with sizes of locations that may vary from one to three! 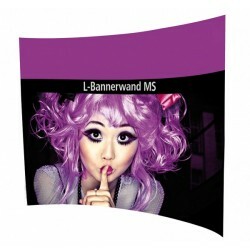 This stand allows you to have a fully customized image and flexible depending on the size of your site. 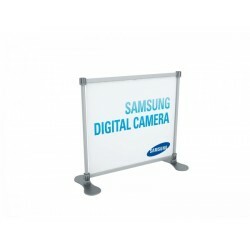 Minimum stand size: 120cmx120cm Maximum stand size: 500cmx320cm Printing and included carry bag free! 1 073,00 €	tax excl. 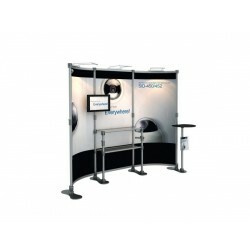 Adjustable stand with LCD holder and table You wish to complete and modular booth to promote your business on your different shows: the modular booth with table and LCD support is for you. Free print and bags ! 1 093,00 €	tax excl. 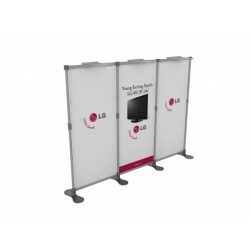 Advertising stand with table and shelves Personalized, simple and practical, this stand with table and shelves is designed to facilitate and optimize the space of your advertising stand. Delivery with carrying bags. Free printing! 1 198,00 €	tax excl. Custom stand with table and LCD bracket Check out this fully customizable table and stand with integrated LCD bracket in the wall! Delivery with a carrying bag! Free printing! 1 208,00 €	tax excl. 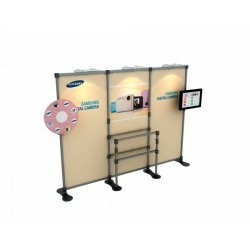 Advertising stand with shelves and LCD holder You want a successful communication at your shows: discover this advertising stand! A support both effective and convenient! Delivery with carrying bags and free printing!